A flooring contractor and father of five from Brooklyn, New York, American citizen Jacob Ostreicher invested his life savings in a Bolivian rice growing business in 2008. He would eventually cultivate the largest rice harvest in Bolivia’s history. But Bolivian officials saw something different. To them, Jacob was either a threat or an opportunity to line their pocket books. In June 2011, Jacob was arrested on trumped-up charges of money laundering and drug trafficking. Officials used his incarceration to take $16 million in equipment and $20 million in rice from his businesses – all without a formal charge. The pretrial detention conditions Jacob endured in Bolivia were, in his words, “sheer terror”. In a large penitentiary housing 3,500 inmates and run by gangs, Jacob was repeatedly assaulted and humiliated. In defiance, Jacob underwent a hunger strike, where he lost nearly 70 lbs. Several judges and attorneys were threatened and intimidated into recusing themselves from the case. His family spent more than $250,000 on attorney fees. In all, Jacob spent 18 months in jail before being formally charged and more than 30 months in jail without being convicted of any crime. Though no judge or jury ever proclaimed him as such, Jacob Ostreicher was treated no differently than a convicted criminal. Pretrial Rights International fought for Jacob’s release, working with U.S. and foreign officials, Congressional members, international tribunals, advocacy groups, and the media to pressure Bolivian officials. 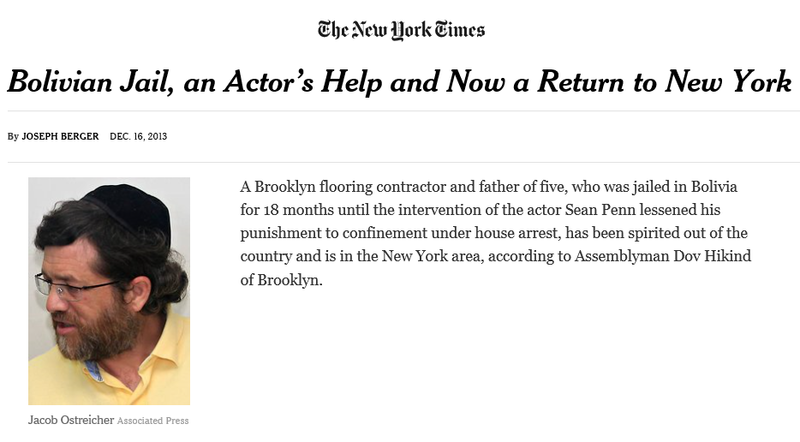 At the request of the Aleph Institute, a foundation that advocates for incarcerated Jews, actor and activist Sean Penn also became involved in Jacob’s case. In December 2012, Jacob was released from prison on $14,000 bail and placed under Bolivian house arrest. One year later, he was back home. 14 Bolivian officials were eventually exposed and convicted of running an extortion ring that victimized Jacob.